Product DescriptionOur large cookie pan is made of heavy weight carbon steel to aid in even browning. The nonstick surface makes cleanup easy and allows you to bake cookies without greasing the pan. Budget permitting, consider buying two cookie pans of the same type. As different pans yield different results, matching pans helps produce a uniform batch of cookies and allows you to keep one pan in the oven while you’re cooling the other, thus speeding the baking process. Our cookie pan has a shallow lip around the edge of the pan, making it suitable for jobs beyond baking, such as roasting vegetables. 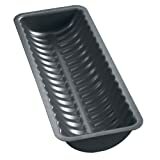 Product DescriptionThis is sturdy, durable bakeware that will stand any cook in good stead through many years of baking. Oversized handles allow a safe and secure grip on hot pans, while the slick surface ensures easy food release. Cleaning is a snap, as might be expected with a piece that is coated inside and out (twice) with silicone polyester non-stick material. So, where is that recipe for baked seasoned potato wedges anyway? 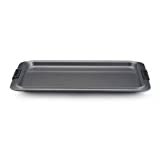 Product DescriptionMake a creative round-top, textured loaf with this Kaiser Bakeware Half Round Loaf Pan. This pan features high quality steel for even heat distribution, with non-stick coating for easy release and quick cleanup.